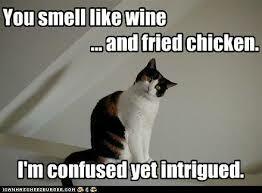 So what wine SHOULD you drink with a fish sandwich or a bucket of KFC? Food buffs will tell you that poached salmon and black truffles is lost without a chilled French chablis. But would they have a clue if you asked them which wine was best paired with a Big Mac and large fries? Motivated by the idea that every meal can be special, a team of experts has developed a guide that matches some of the nation’s favourite snacks and takeaway meals with their perfect wine. The researchers promise to make every meal ‘a memorable experience’ by listing the best wine to go with anything from a fish finger sandwich to Marmite on toast. Tesco surveyed 20,000 people to find 14 of our favourite meals and match them with wines. For example, the experts said Scotch eggs should be teamed with a Swartland chenin blanc, whose ‘round peachy texture works beautifully with the soft texture and rich flavour of the egg’. A McDonalds Big Mac meal is best accompanied by a zinfandel because its ‘plummy sweet fruit characters pair well with the sweet flavours’ of the chips and burger.